... was simply amazing and I would go again tomorrow if only I could afford it. It's certainly not cheap. Was it worth it? You bet. The workshops are expensive but worthwhile for all the techniques, products to try out that maybe aren't available over here or are but not easily accessible, people to meet or just see from afar. I had an absolute ball. Workshop no.1 was Alexis Toupet who IS Carabelle Designs and what an absolutely lovely guy. Truth be told nobody finished any of the workshops I did in the time allowed but we did enough so that we could finish off at home or in my case at the hotel. Stencilling, stamping, inking, painting, dribbling-not literally, cutting, misting, distress inks, Caran d'Ache neos. Fun fun fun. Loved it. Delighted you had a great time :). Did you fill up those gorgeous bags you made? Gorgeous! 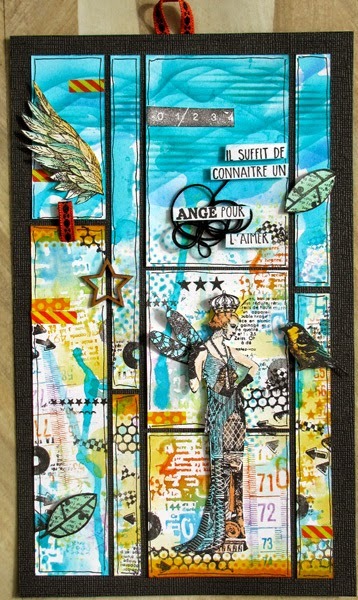 I love the colours you've used to create the fab background! Beautiful. Love the colours and all the detail. Wings are fabulous.